Insurance companies are full of professional — sometimes even friendly — people, but always remember that no insurance employee is ever your friend. While expediting your claims process and having good customer service both help their business model, paying out as little as possible for each claim helps them out quite a bit more. In other words, an insurance carrier is much more motivated to reduce the amount of money paid out in a claim than they ever will be to offer what you might consider a fair settlement. To accomplish this goal, they may often use a few common tactics that prey upon the average person’s lack of knowledge in legal or regulatory matters. 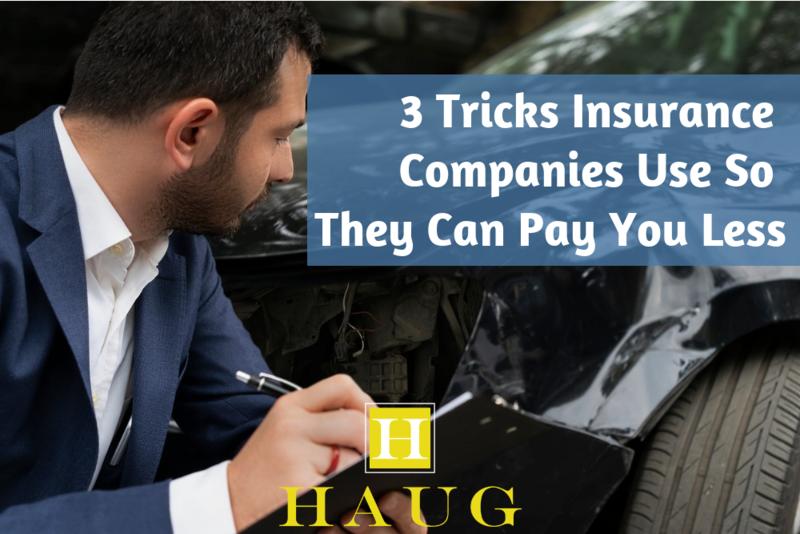 By exploiting common insecurities or social norms, the insurance company you are filing a claim with can essentially manipulate you into giving up a large portion of your actual total damages. This problem is especially pernicious when dealing with third-party liability insurers that represent the driver who hit you in a car accident. You may notice that this is a pretty limited list, especially compared to what an insurer may ask. They may want further details on the accident, like whether anyone might have ignored a traffic signal or whether you were wearing your glasses. Always exercise caution when answering questions by an adjuster in general. They may catch you off guard by asking about your medical history or any criminal record you may have. You should be especially wary of making statements that will be recorded. Instead, defer to your attorney and only offer them the bare minimum. Be wary of anything an insurer asks you to sign. They may tell you that the form is necessary for processing your claim, but always consult with an attorney first. One of the most common traps an insurer will lay is to send you a general medical records release form. While they may understandably need access to the original medical files for procedures related to your accident injury, these forms often request to release all of your medical information. Everything from the tonsils you had taken out when you were a kid to STD test results you got in college are open to their perusal. Potentially, an insurance company could use this information to allege that your injury treatment costs were compounded by an earlier condition. If they can make a convincing argument that expenses weren’t directly related to the accident, then they can reduce a claim. Avoid falling into this trap by reading any forms carefully and, if possible, having an attorney review them. Many people jump at the first insurance offer they receive. Tragically, this settlement will typically be much lower than what the injury victim will need to manage all of their damages, including long-term care costs and incidental costs like diminished vehicle value. An insurer can bait the hook particularly well by ignoring your contact requests for weeks on end. Then, when they respond with an offer, you are so relieved that you jump on it. You can sidestep this problem by having an early estimate in mind with a fair assessment for the full costs of your injury treatment and accident damages. Don’t overlook things like lost income, pain and suffering, or things like hospital parking costs. An experienced Atlanta car accident lawyer can help you review these costs and anticipate expenses that blindside many injury victims. Then, you can demand a fair counter-offer. Car accidents are devastating, and they are costly. On top of all this, you may be anxious to fully cooperate with insurers just so you can resume having a normal life. They are counting on this, but you can avoid falling into their confidence tricks by being aware of their profit motive and some of the common things they do. Protect your rights to fair compensation by scrutinizing everything an insurer asks of you or sends you to sign. You also always have a right to hire an attorney to negotiate on your behalf, taking the pressure off of you to be polite when being firm would work so much better.